A three pound bag of broccoli and a request for pasta salad figured, in equal measure, into the selection of recipes I'm featuring today. The broccoli, which seemed like a great idea a week ago, had become an irritation, a reminder of poor planning on my part, and it was demanding to be used or tossed. I'm really bad with the whole tossing thing, so, I decided to use at least some of it in a pasta salad that I had promised for a potluck supper. I had just seen a recipe on Serious Eats that used broccoli to make pesto and thought I might be able to use it in my potluck offering. 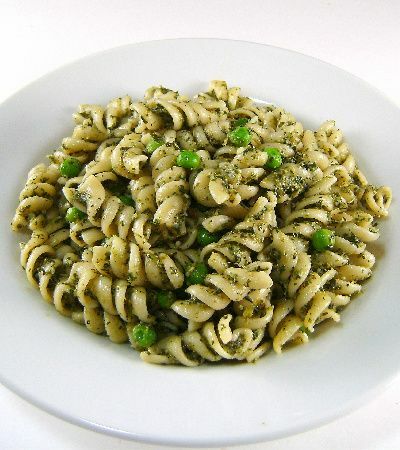 Years ago, Ina Garten published a recipe for Pasta, Pesto and Peas. I had saved the recipe, but never made the dish and thought the potluck was a perfect opportunity to give it, and the broccoli pesto, a try. The pesto, developed by Carolyn Cope, is wonderful. It lacks the eyeopening brightness of its basil cousin but it is delicious in its own right. The pasta salad is a mixed bag. While it's delicious, it lacks visual appeal. Its drab muddy color is unfortunate and may be off-putting to some. Both recipes are easy to do and inexpensive to prepare. Both are also delicious. Here's how they're made. 1) Bring large pot of well-salted water to boil over high heat. Add broccoli florets and cook for two minutes. Drain broccoli well and set aside. 2) In food processor, combine broccoli, walnuts, garlic, lemon juice, and salt. Pulse until broccoli and nuts are finely chopped. Then, with motor running, pour in olive oil in slow stream. Mix in grated cheese. 3) Toss with pasta, spread onto toasted baguette slices, or as sauce for chicken or fish. Pesto will keep in sealed container in the refrigerator for up to three days. Yield: 1-1/2 cups. 1) Cook fusilli and bow ties separately in a large pot of boiling salted water for 10 to 12 minutes until each pasta is al dente. Drain and toss into a bowl with the olive oil. Cool to room temperature. 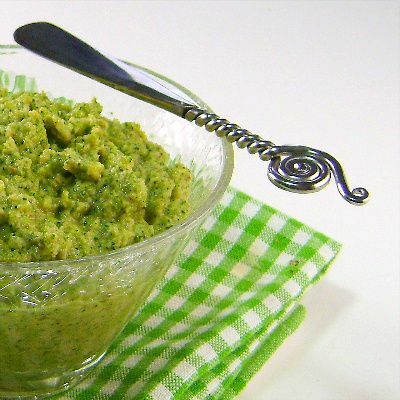 2) In bowl of a food processor fitted with a steel blade, puree pesto, spinach, and lemon juice. Add mayonnaise and puree. Add pesto mixture to cooled pasta and then add he Parmesan, peas, pignoli, salt, and pepper. Mix well, season to taste, and serve at room temperature. Yield: 12 servings.